Nesting & Stacking cups: Liam is constantly grabbing for these! I love that they are both nesting & stacking, which has been hard to find! They are easy for his little hands (well... he actually has huge hands for a baby his age) to hold but durable as well. Liam spends plenty of his time organizing these cups and destroying the towers that he patiently waits for us to build. He has even just started to try and stack things himself! Osprey Poco Plus: This is the perfect pack for hikes, as well as everyday use. Conor puts little L in this when he is doing yard work and even occasionally when he is cooking. Liam is happy as can be up there. He can see perfectly and enjoys the movement; he's even fallen asleep in it a few times while Conor is mowing the lawn! We've also used it at the zoo & Oktoberfest. It has all the features you would want, such as a rain/shade cover & pockets for storage (perfect for bringing a few drinks on your hikes)! It is a bit bulky and heavier for me, so I still prefer to carry Liam in my Baby Hawk Mei Tai when I'm alone. Noah's Ark: This was a gift from Liam's Godmother for his baptism! Such a fitting gift for the occasion! This is probably Liam's most favorite toy right now. He pretends to walk the animals into the ark and practices the different animal sounds. Other times he just throws the pieces everywhere; that's fun too! Some of the pieces are incredibly small and therefore present a choking hazard. While Liam is the past the stage of putting everything in his mouth, I still only let him play with this when I am right there with him. The entire set is made of wood and has a fairly modern look to it. The Ark looks so neat displayed on his fun playroom shelves! Xylophone: This is a close runner up as Liam's current favorite toy! Again, the whole toy is wooden so it is a much quieter option than some xylophones. The sounds aren't obnoxious at all, which makes for happy parents. It's also lightweight, making it easy for Liam to carry it around! 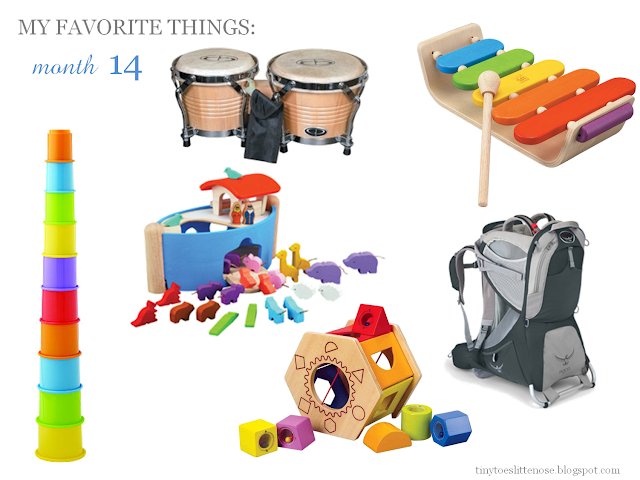 Bongos: With Liam's love of music, another instrument makes the list! These aren't obnoxious either, and actually make quite fun sounds. I think Conor & I might have just as much fun playing them as Liam! They are the perfect little addition to his teepee, which is where he usually plays them! It's even cuter when he's a naked nudey running in & out of his teepee to have little jam sessions on the bongos! Shape Sorter: This is the best shape sorter out there! It's more challenging than most, so Liam is just getting into it. The shapes themselves have little balls inside them, so they make a fun sound when you shake them. This is toy is wooden (surprise, surprise) and very durable! I highly recommend any of these for your little ones! They are definitely all well loved in the Keenan household! Now, I would love suggestions from you experienced mamas for the upcoming months! We loved stacking cups and bongos at this age too! Great recommendations for the little ones! I miss the baby stage!